Hafragrautur, or oatmeal is a staple diet of Icelandic families. Oats and water or milk are mixed in a pot, left to simmer. Hafragrautur is usually served with a sprinkle of brown sugar or a handful of raisins or a small cube of butter. This bowl of porridge really brighten our day, because in our we love oats. 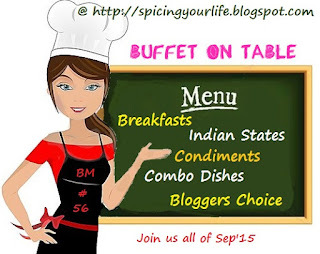 Week 4 day 5 of our Mega marathon and this week the theme is Breakfast from Countries. Soak the oats in water for 3 - 4 minutes. While the oats are soaking, bring the milk to a boil. When it begins to boil, add the soaked oats along with the liquid. Reduce the heat to low and cook for 5 - 6 minutes or until the mixture becomes very thick. Remove from heat, stir in nutmeg along with sugar and mix well. Serve it in a bowl spinkle brown sugar and raisins. Have this comforting and filling porridge warm. Very different and quite an interesting porridge, love the addition of raisins here. Porridge is a lovely breakfast and is served in many countries, though in different styles...a good choice for breakfast. Very healthy and filling breakfast. That surely sounds like a great way to start the day! simple yet healthy porridge ..
What a comforting and healthy way to start any day. Simple and healthy. I usually add more fruits to it. A healthy and yummy way to start the day!